Region: 35 miles south of Austin, 45 miles north of San Antonio on I-35, in the Texas Hill Country. Romantic 1883 Victorian bed and breakfast inn and garden complex (13 rooms in 3 buildings), featuring roses, topiaries, fountains, and beautiful old pecan trees. The designer rooms have graced home and garden magazines, as well as numerous publications such as Country Inns, Southern Living, and USA Today. 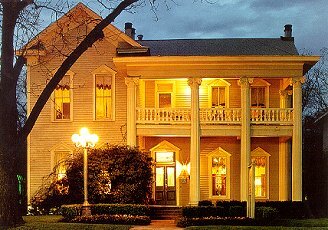 Named to Fodor's "Best Bed & Breakfasts in the U.S."; Southern Living has called us one of the most outstanding inns in Texas; holds 3 stars from Mobil Travel Guide (only 7 out of the 1200 in Texas have more than two). In summer of 1998, an area-wide newspaper poll named us "Best Hotel in Hays County". Features include fireplaces, canopied beds, clawfooted tubs, TV's, phones, sitting rooms, and horsedrawn carriage rides. Full gourmet breakfasts are headliner events--Eggs Benedict, Bananas Foster crepes, and raspberry French toast. We are widely known for theme weekends: romance getaways, rivertrips, and especially our murder mysteries. Close to wineries, antiquing, historic districts, nature parks, whitewater sports, and shopping at the biggest outlet mall in Texas (150 stores and growing). The Inn recently opened a large fully-furnished 2-bedroom executive apartment, perfect for business travelers and prolonged Hill Country vacations. This and other San Marcos Bed and Breakfast Inns can be found here in The Register.